Erich Fromm sees right to the heart of our contradictory needs for community and for freedom like no other writer before or since. In Fear of Freedom , Fromm warns that the price of community is indeed high, and it is the individual who pays. Fascism and authoritarianism may seem like receding shadows for some, but are cruel realities for many. 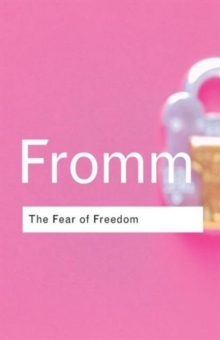 Erich Fromm leaves a valuable and original legacy to his readers - a vastly increased understanding of the human character in relation to society. At the beginning of the 21st century, it is more important than ever to be aware of his powerful message.